Digital cameras have changed the way we take pictures, but if there’s one essential design flaw it’s that they’re so easy to damage and even ruin. The lenses and LCD screens are often exposed when the camera is in your pocket or bag, leading to heartbreaking scratches and cracks that make the whole camera essentially useless. This design from Sun Ho Sin and Jeong Eun Park would make those accidental injuries a thing of the past. The Zero Angle Digital Camera features a 360-degree swing-around protector that also functions as the LCD screen. When closed, the cover protects both the lens and the screen. 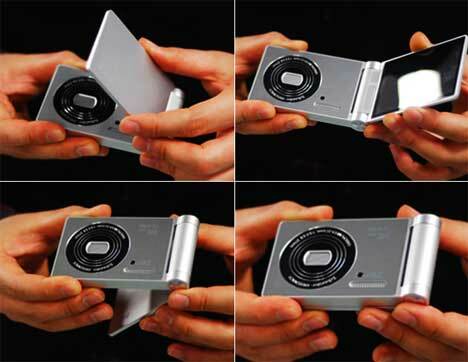 When open, the camera functions just like any other digital camera. It’s a simple but elegant solution to a problem that plagues so many of us. See more in Camera & Video or under Gadgets. April, 2010.